There’s a report in Google Analytics that can be very useful in optimizing your pay per click campaign. In order to get to the keyword report, in the left navigation select “Traffic Sources” and then “Keywords”. The top search terms/ keywords that people have used to arrive at your website from your pay per click campaign will be listed. The third and fourth columns are named “Pages/Visit” and “Avg. Time on Site”. In our example we have highlighted the term that had the highest and lowest numbers in these columns. Not surprisingly – the search term (overseas adventure travel) with the lowest number in column three also has the lowest in column four and the highest bounce rate (column six). In other words of the 159 visitors who came to the site by typing that search term into Google, and then clicking on our client’s ad, most did not click through to any other pages. The average time spent on the website was seven seconds. On the other hand, the search term “all inclusive honeymoons” had the highest number in columns three and four, and the lowest bounce rate. 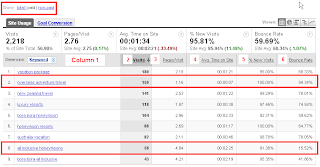 So of the 58 visitors who clicked on our client’s ad, only 15.5% did not click through to other pages. The average time spent on the website was about 2 ½ minutes, and the average pages viewed was about 5. It’s clear which search term is more valuable. Although many more people arrived at the site searching for “overseas adventure travel” than for “all inclusive honeymoons”, we don’t want to pay for clicks if people are going to be quickly exiting. As a result of this data, we paused the first search term and plan to create and test a new landing page for it. We also increased the bid on the second search term in order to try and increase our position in Google. In addition, we will optimize the landing page for “all inclusive honeymoons” so that we may benefit from free Google traffic as well. Please, contact us for more information regarding our Google Analytics Consulting services. Why Hire an SEO Consultant or SEO Company? The Internet is the biggest market place today and is growing bigger every day. If you have already spent money to build a website and declare your presence on this huge market, you will probably want to better promote your business online and to better target your potential clients. How do those potential clients shop the huge Internet market? They use search engines to find the product or service they are looking for. And where your website is listed in the SERPs (search engine results pages) for the products and services you offer is very important for your successful online presence. If you've got plenty of time on your hands you can try to do your own SEO. If you'd prefer to concentrate your efforts on running your business, then hiring an SEO Consultant or SEO Company is the perfect solution and our SEO services are highly recommended. SEO isn't rocket science, but it is hard work. If you are busy running your business you can hire us to take care of your search engine optimisation. A full-service Chicago internet marketing agency, Proceed Innovative LLC helps companies extend brand awareness and drive sales through interactive marketing strategies, search engine optimization, ppc management, creative web design, website promotion and web analytics consulting. Google's Pay-Per-Click (PPC) program is called Google AdWords. PPC is an easy way to get some search engine visibility. This however may not be the most effective Internet marketing option. Naturally (SEO) ranked websites are preferred option by the searchers. In most cases the best solution is a well-designed mix of PPC and SEO. This search engine marketing approach allows businesses to get free traffic on the most expensive and popular terms as well as to stay in front of their prospects for less popular and seasonal search terms. Keep in mind that PPC works great for promotional and seasonal items. Visit www.proceedinnovative.com for more information, register for our free Internet marketing seminar or contact us. We will gladly assist you. Search Engine Marketing is the fastest growing direct marketing channel. Advertisers spent $9.4 Billion on Internet Marketing in 2006. Spending is projected to grow to $18.6 Billion by 2011 in North America. Search Engine Marketing is moving forward at the speed of light. Sign up for our next Search Marketing Seminar. With so much so happening in your day-to-day business, it's tough to stay ahead of the competition and understand the full potential of the Internet. Proceed Innovative can help you get noticed. Our team of professionals is experienced in every component of online marketing and can help you understand the options available to your organization, including key concepts to consider when making important advertising decisions. Google has become an internet icon and in everyday conversations you will often hear people say "just Google it". This shows the massive impact of this search engine on people's lives. Google is an advertising media that, if used properly, can provide an abundance of highly converting traffic. How to stay ahead of the competition through smart, well-balanced marketing strategies including organic search optimization (SEO) and PPC management. 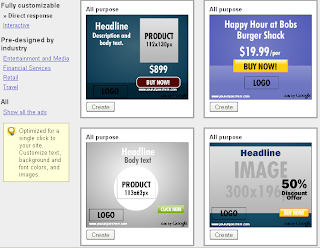 How and where to allocate your advertising dollars in the online ad space. How to measure and refine your online marketing campaigns to increase effectiveness and improve your return on investment (ROI). Learn how you can compete online - sign up for our free seminars.